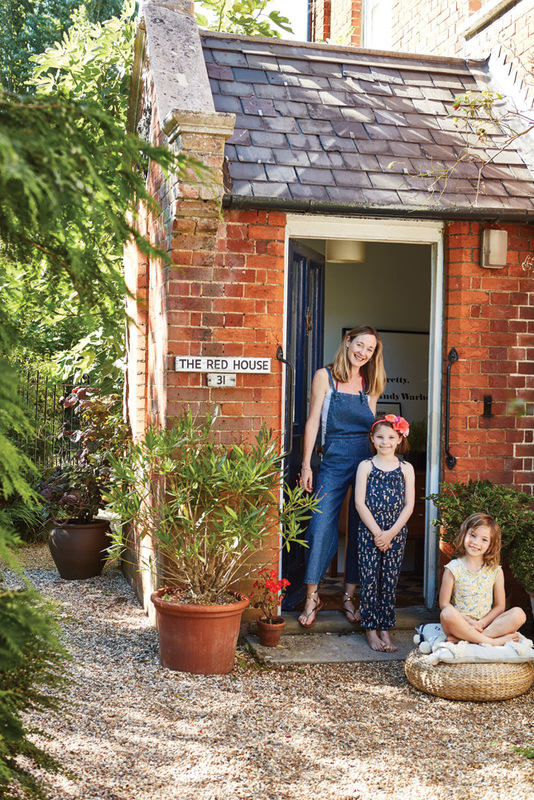 Dubliner and editor of Essential Kitchens Bathrooms and Bedrooms Ciara Elliott’s move to the UK in many ways resembled an episode of Escape to the Country. Despite having a hectic day job in the media, the farmhouse she returns to every night is akin to a movie set; whimsical and inviting. Ciara often documents this juxtaposition on her Instagram. Though the farmhouse renovation is still a work in progress, we couldn’t wait to have a peak into what Ciara and her family have done so far. From the get-go, Ciara and her partner Ben knew that the Red House was the kind of country oasis that came with its own brand of magic. The Georgian farmhouse once belonged to artist Peter Coker who maintained the garden in a French Monet style; a lily pond surrounded by lavender, pretty flower beds and magnolia, pear, fig and olive trees. Just twenty minutes away is where the Romans built their capital Camulodunum, or Colchester as it’s now known, when they conquered England. A short drive from there, Ciara, Ben and their two daughters Edie, 8, and Astrid, 6, spend their weekends at the seaside. Indeed, the kind of stuff of Escape to the Country dreams. The couple lucked out when they bid successfully on an original Parker Knoll armchair. It sits beside a Beni Ourain rug from La Redoute and selection of artwork by Irish artists Joby Hickey and Emma Sheridan. The red Habitat lamp pops out against the Farrow and Ball Ammonite wall colour. 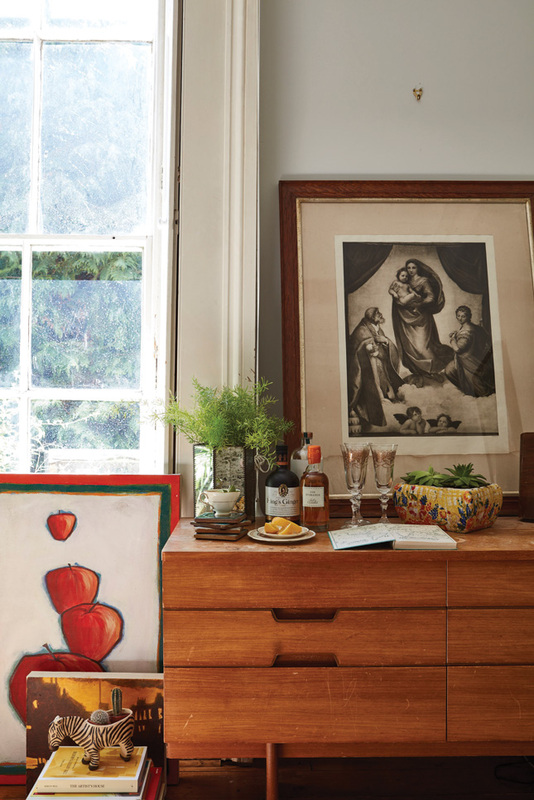 A mix or vintage and high street finds sit on top of a mid-century sideboard the couple picked up at an auction. 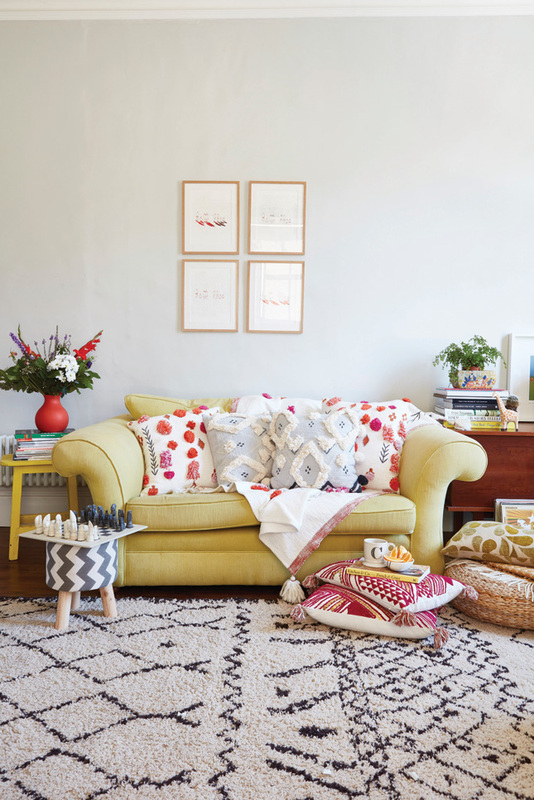 Ciara had the Heals sofa reupholstered in a sunny yellow linen and now layers it with a selection of Moroccan-inspired cushions from Anthropologie. The artwork above it is by Darren Howart. Ciara and Ben picked up the vintage armchair at an auction and jazzed it up by layering on some textiles from Anthropologie. 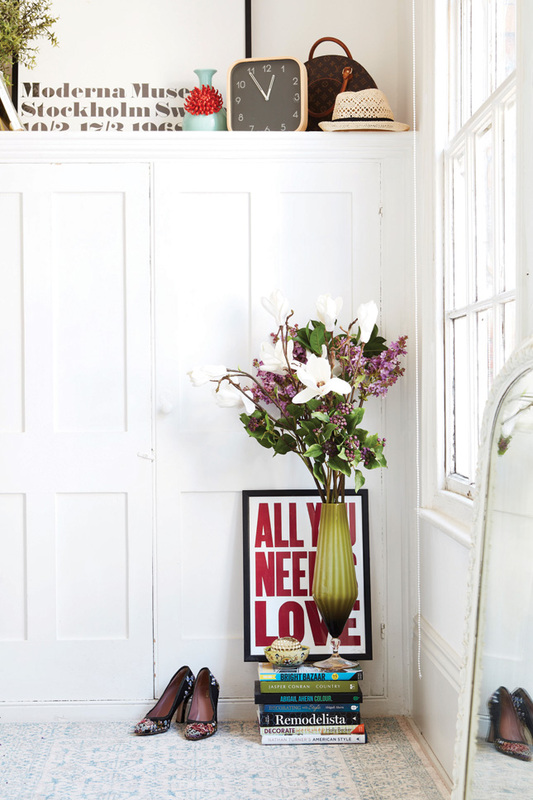 Pops of colour add a boho touch to the otherwise calm and neutral room which was painted in Farrow and Ball’s Strong White. The Hector floorlamp from Original BTC adds a soft glow on some of Ciara’s most-loved pieces from Marks and Spencer and Anthropologie. 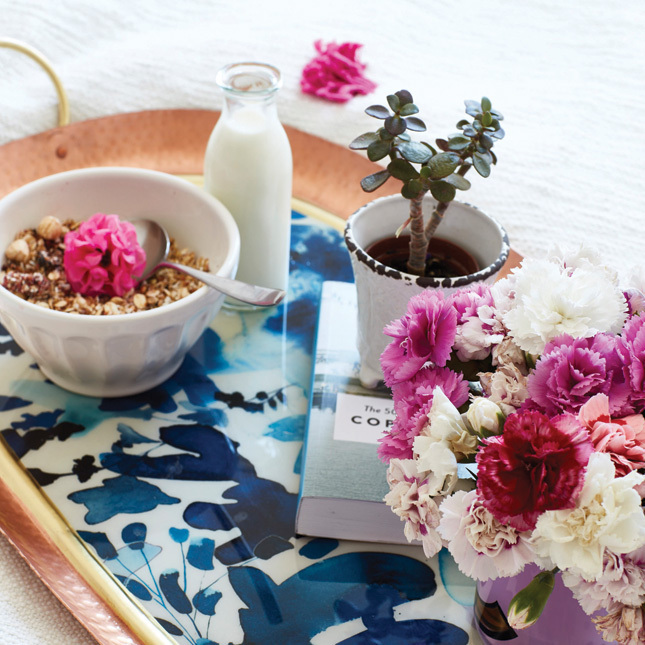 We imagine this bedroom to be one of the loveliest spots to enjoy breakfast in bed on a gorgeous Anthropologie tray! 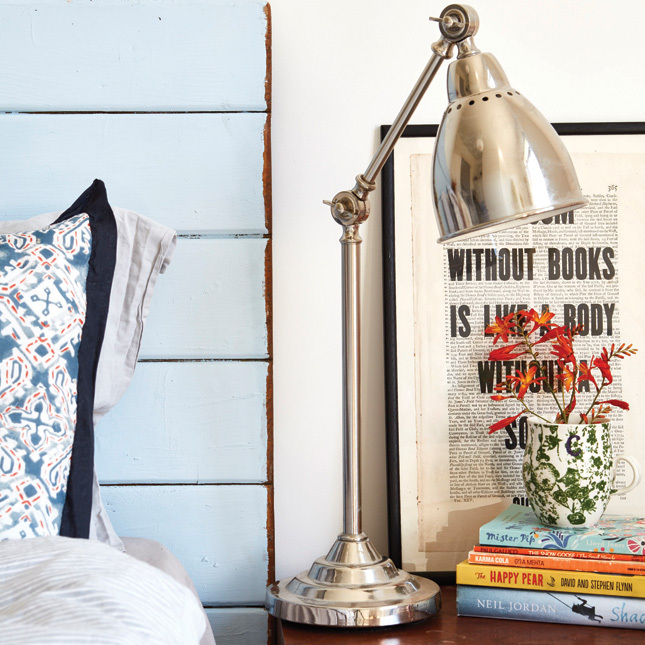 An Ikea Barometer lamp adds an industrial touch to Ciara’s bedside table. The headboard, painted in Bluebell by Bert and May served as the perfect backdrop for the Neptune bedlinen. Ciara’s dressing area is accessorised with some of her favourite fashion finds as well as an antique mirror and oversized vase. Until then, Ciara is busy collecting bits and pieces for the remainder of the farmhouse renovation. Her knack for creating soulful, layered vignettes requires some legwork. “Without sounding like a total cliché I really do shop everywhere! Most of our furniture has been bought at auction or bought on eBay and given a new lease of life – a paint job, upholstered etc.” And for anyone visiting England’s south east, Ciara has some interior hotspots she recommends for stylish Scandi pieces; “Vanil and Tea and Kate. I could shop in either shop and furnish my whole house”. Ciara also recommends larger chain stores like Heals, Anthropologie and The Conran Shop. 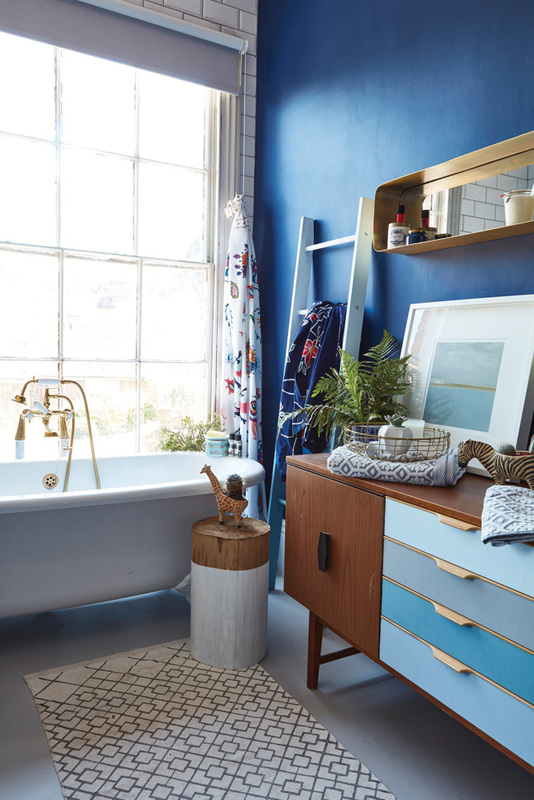 The traditional roll-top bath with gold fittings came from the Waverly range at Homebase. The couple upcycled the sideboard and ladder by ombre-ing them with shades of blue from Bert and May. An inexpensive H&M rug and paintings by Dublin-based artist, Deirdre Hayden and Suffolk painter, Abi Fawcus add some personality to the space. Everything sits nicely against the Tuxedo Blue wall colour by Valspar at B&Q. 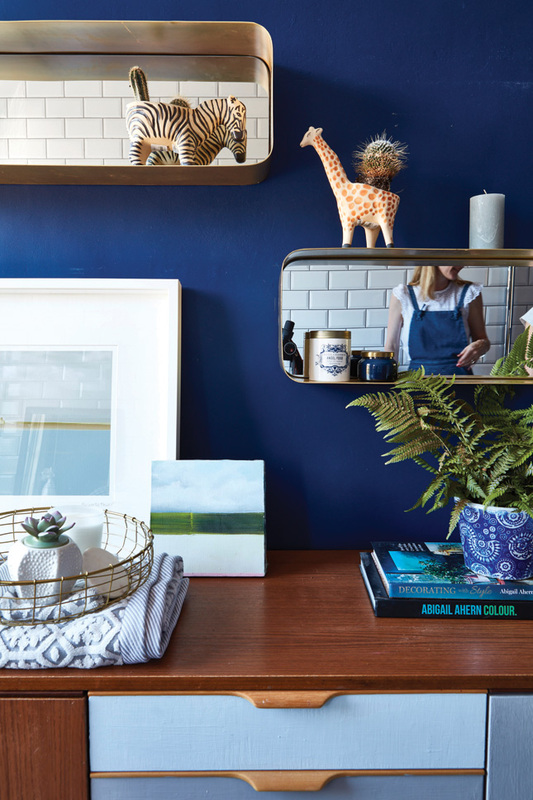 Anthropologie’s Industrial Mirror Shelf is both a practical and stylish solution for a bathroom. 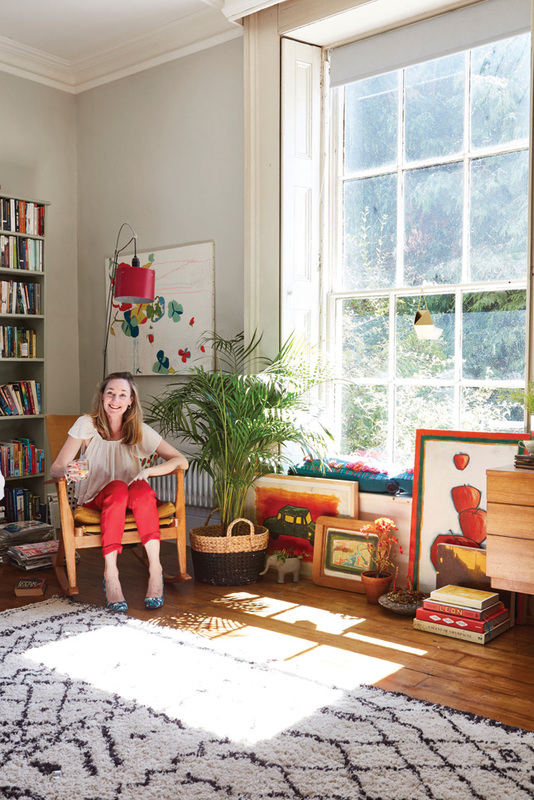 Red House is a lovely example of a layered, collected home; something Ciara is proud of- “I don’t want to buy only one ‘look’” she explains. “Nothing is too contrived or trendy.  A home should be about who you are and what you do.” One way this house has avoided looking too overdone is by keeping the paint colours neutral and the lighting soft. “I am all about no overhead lights and lots of pools of lighting in different corners of the room. So a chair with a reading light overhead, for instance, or a table with hanging pendants, defining that space. 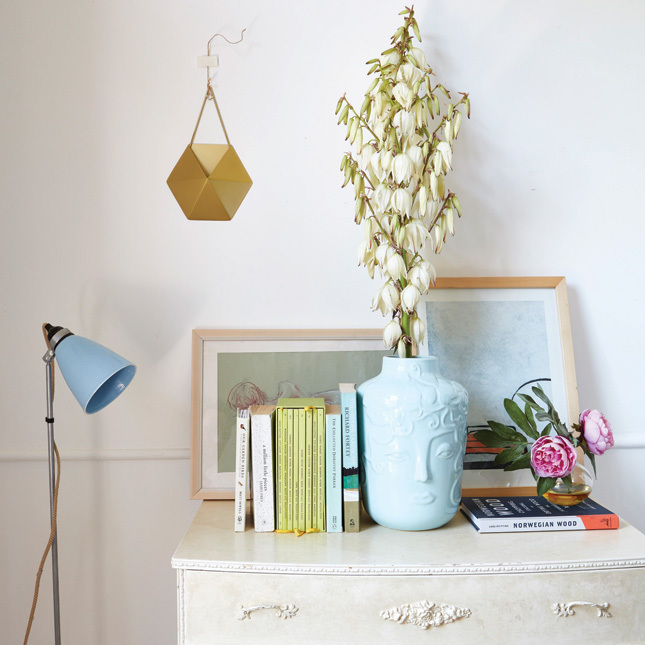 I also love floor lamps and exposed bulbs and all of the fun you can have with bedside lights”. Still, even with all of that lighting, nothing beats those sash windows! When asked what her favourite part of the house is, Ciara excitedly tells me that it’s the incomparable charm of Red House (even in its current, semi-dishevelled, still-under-construction state!). Giant windows, high ceilings and even quaint features like the original maids’ bells aren’t something every homeowner is lucky enough to have. But in this case, they certainly don’t go under-appreciated. 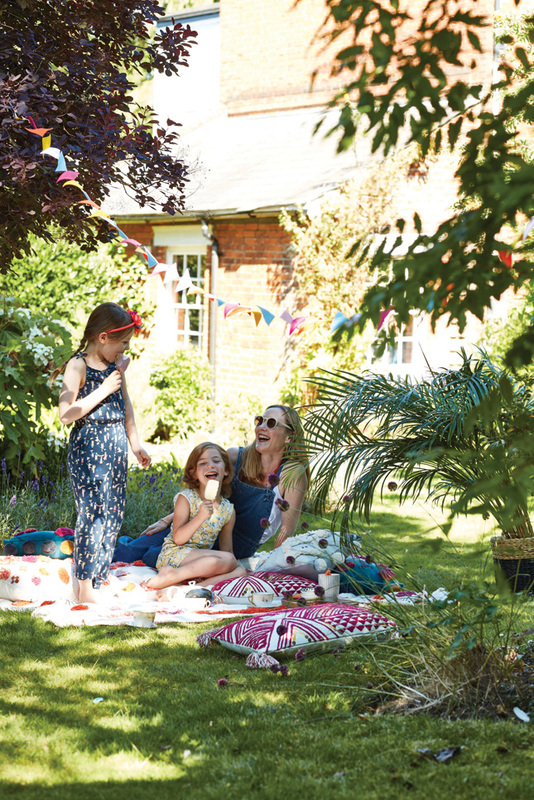 The family love to soak up the sun on cosy cushions from Anthropologie.